One person was killed and seven others were hurt when a Southwest Airlines jet blew an engine at 32,000 feet Tuesday, sending shrapnel shooting through a window and setting of a desperate scramble to save a woman from getting sucked out of the depressurized cabin. 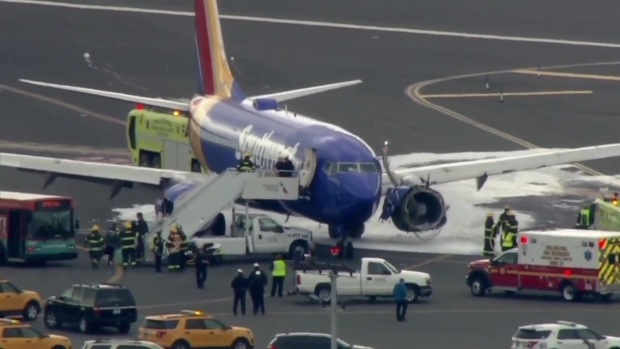 But travelers aboard twin-engine Boeing 737 bound from LaGuardia Airport to Dallas Love field said they were able to pull the woman back into the plane after the blast, which forced the craft's pilot to take it into a rapid descent to make an emergency landing in Philadelphia. "I just remember holding my husband's hand, and we just prayed and prayed and prayed," said passenger Amanda Bourman, of New York. "And the thoughts that were going through my head of course were about my daughters, just wanting to see them again and give them a big hug so they wouldn't grow up without parents." The woman who died in the blast was identified as Jennifer Riordan, a mother of two and a public relations executive at Wells Fargo in Albuquerque, New Mexico. Her death marks the first fatality during an accident aboard a U.S. airline since 2009. Jennifer’s vibrancy, passion and love infused our community and reached across our country," said family spokeswoman Tania Armenta. "Her impact on everything and everyone she touched can never be fully measured. But foremost, she is the bedrock of our family." Seven of the other 148 people aboard the plane were treated for injuries after the landing in Philadelphia. Footage captured from a NBC Philadelphia helicopter show bent metal and what looked to be part of the front of the engine missing entirely. The images also clearly showed one of the plane's windows was gone. Raw chopper footage shows a large response on the runway, with more than a dozen firefighters and several emergency vehicles surrounding the damaged plane. The National Transportation Safety Board sent a go team to the landing site to investigate along with the Federal Aviation Administration. NTSB chairman Robert Sumwalt said based on a preliminary examination, there was evidence of what he called "metal fatigue" near the site where the turbine's fan blade comes into the engine's hub. Photos of the plane on the tarmac showed a missing window and a chunk gone from the left engine, including part of its cover. Sumwalt says part of the engine covering was found in Bernville, Pennsylvania, about 70 miles west of Philadelphia. Sumwalt added that the investigation will take 12 to 15 months to complete. 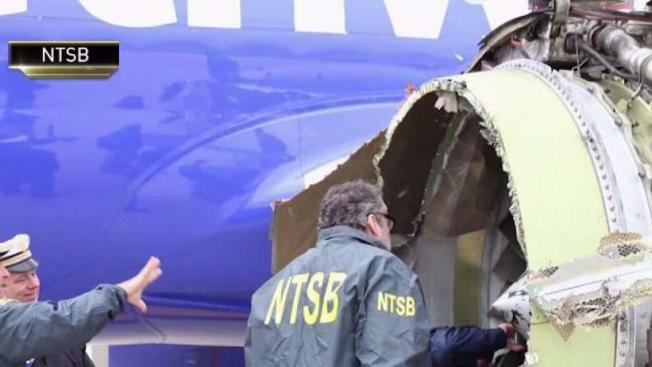 Southwest Airlines says it's speeding up inspections of engines like the one that failed and sent debris smashing into a plane window, leading to the death of a passenger. Southwest said Tuesday it expects to finish inspections of the CFM56 engines over the next 30 days. It says it's making the move out of caution. "Safety is always our top priority at Southwest Airlines, and we are working diligently to support our Customers and Crews at this time," the statement said. Two passengers sitting in an exit row said they were right by the engine that exploded. Connor Martin recounted hearing a noise, and "everything shakes up." "I look outside, and it's totally broken apart, folded back on itself," he described the engine, then goes on to say the window a few rows back blowing out. "We didn't know what was going on," said Anna Montie. "There was just like a lot of commotion like three rows behind us." That's apparently where a woman sitting next to the broken window started getting "sucked out." "There was a panic once the window broke and she was out of the window," said Martin. "Everybody kind of rushed in to pull her back in the plane." Another traveler described what sounded like an "explosion" 20 minutes into the flight as a piece of the engine appeared to smash into a window. Matt Tranchin, a 34-year-old from Dallas, said he was sitting in seat 17E, three rows behind. "The plane dropped immediately. Our oxygen masks dropped immediately," Tranchin said. "Ash was all around us. The passenger who was sitting right next to the window that exploded was in critical condition, covered in blood." 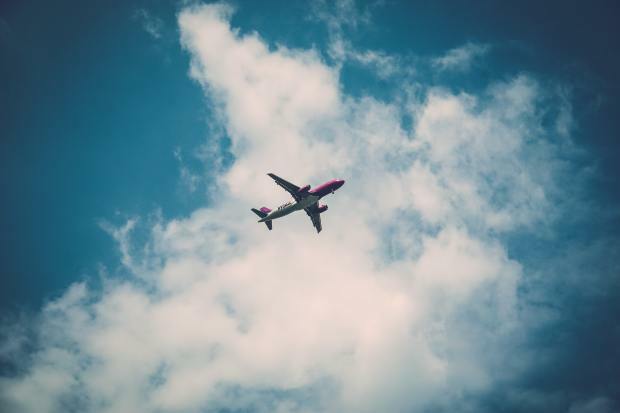 Tranchin described the whole experience as "horrifying," noting that while waiting to land everyone still had internet and texting capabilities. He used that time to message family in the case he wouldn't see them again. “I spent the next 15 minutes saying goodbye to my family,” Tranchin said. "My wife is in her third trimester. We’re expecting our first child. It was one of those things when you don’t want to terrify your family but if you do go down you don’t want to not say goodbye." One terrified passenger posted a live video to his Facebook page during the ordeal. The grainy footage shows a man attempting to secure his yellow oxygen mask while updating loved ones following his feed. "Something is wrong with our plane! It appears we are going down! Emergency landing!! Southwest flight from NYC to Dallas!!" Facebook user Marty Martinez wrote. He then added, "We are bracing for landing!!" Passenger Eric Zilbert, who said he saw the woman "partially sucked out of the plane, the window had gone out there," didn't know afterward whether she was OK.
"They carried her out. We don't know how she was," he said. "They did render CPR to her almost immediately. There were several heroic gentlemen who pulled her back through the window and administered CPR." Passengers said despite the panic and shock, the plane was "very stable" as it made the emergency landing. "I didn't take my mask off till I was sure there was plenty of air in the plane but... the plane continued to fly perfectly," said Zilbert. Tranchin said all aboard burst into applause when the plane landed. “There was a lot of hugging,” he said. “I personally hugged the pilot, I think just relief, relief that we get to live for another day." Firefighters responded to the engine fire within three minutes of the call, Philadelphia Fire Commissioner Adam Thiel said at a news conference Tuesday afternoon. They applied foam and extinguishing agent to the plane, taking just about an hour to get the fire under control as they quickly evacuated the plane. Meanwhile, another flight out of LaGuardia was forced to make a diversion Tuesday afternoon. That flight, which was headed to Richmond, Virginia, diverted to Dulles airport after a problem with a tire. The Delta Connection flight left LaGuardia a few minutes after the Southwest flight, though there was no indication the two incidents were connected.